Madison College’s leading scorer Tynia Goldensoph (18) drives past an opponent during a recent match. After going 2-2 in its last four matches, the Madison College women’s soccer team will finish the season with a better record than it posted a year ago. Last year, the WolfPack finished 5-7-2 overall. The team currently stands and 6-5-1 and with just two matches left is guaranteed a better overall record than it posted in its inaugural season. How much better will depend on how the team does against Concordia University JV on Oct. 12 and Harper College on Oct. 14. In its most recent match, Madison College suffered a 3-1 loss to College of DuPage at home on Oct. 9. DuPage scored the game’s first two goals, before Katie Travis scored Madison College’s only goal at 69 minutes and 53 seconds into the match. The WolfPack actually out-shot its opponent, 15-7, but was unable to convert on enough of its shots. Tynia Goldensoph and Kaitlyn Baudhuin both scored twice to help lead Madison College past visiting Elgin Community College, 5-2, on Oct. 7. Jamie Erickson added the team’s other goal, while Arianna Viscarra had three assists for the WolfPack. Kaitlyn Bauduin scored the game-winning goal just minutes into the overtime period against Joliet Junior College to give Madison College a 2-1 victory on Oct. 2. The assist on the game-winning goal went to Goldensoph, who scored the WolfPack’s first goal just 5:45 into the match off a pass from Lindsay Kraemer. A four-goal first half gave Rock Valley College more than enough offense in its 5-0 victory over Madison College on Sept. 30. Madison College actually out-shot Rock Valley in the second half, 11 shots compared to 6, but was unable to find the net. 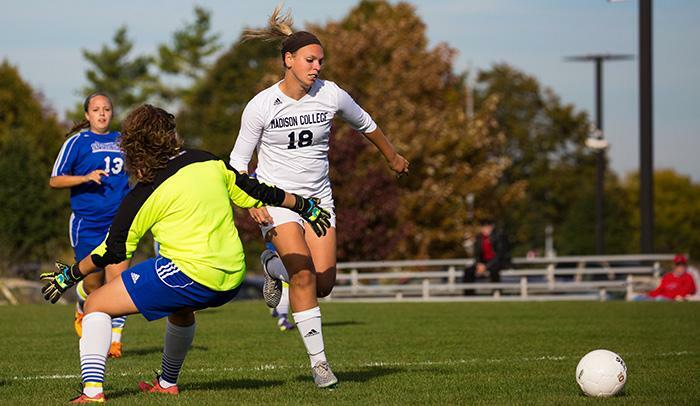 The loss marked the second time this season Madison College was shutout.